Best known as the sports director for WBAL-TV and the radio play-by-play voice of the Baltimore Ravens, Gerry Sandusky, also operates The Sandusky Group, a firm that provides executive media coaching and courses to improve presentation skills for business executives. 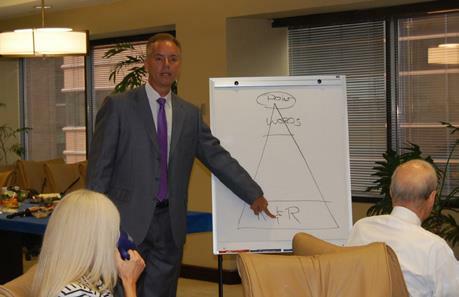 He recently provided a training course to the Adelberg Rudow attorneys. Using a drawing that depicted his “Perception Pyramid,” Sandusky explained how audiences interpret and process the various elements that emanate from a presentation including the perceived reputation of the speaker, his relationship with the audience, the actual words being used, his body language, appearance and tone of voice. To demonstrate this point, Sandusky explained the circumstances surrounding a speech he gave to a high school football team, while working for a television station in south Florida. “My speech consisted of 12 pages and I started reading it in front of a team in a particularly unsavory part of town,” he recalled. “After three pages, the players looked bored,” he explained. “After four pages, they started booing me. Then, objects were being thrown at me. So I stopped reading. What do you want, I finally asked? Partly due to smartphones and other technology, the average attention span for Americans is now eight seconds. “Watch your nightly news and you will see eight second sound bites,” Sandusky said. “When people watch something on a television news program, about 90 percent of the audience will remember one fact, 50 percent will recall two items and about 15 percent will retain three things. And, this number is dropping,” he said. The lesson? “Keep your presentation short and to the point,” he concluded.